Kitchens Are Monkey Business: Coast Guard Rescue. Please watch this video of Coast Guard heroes rescuing 14 of 16 crew members of the HMS Bounty. The crew abandoned ship last night about 90 miles off the coast of Hatteras. The ship issued a distress call at 6:30 Sunday evening, at which time it had lost power and pumps. The Bounty Organization contacted the Coast Guard which sent out a C-130 to track the ship. By 4:30 AM, the deterioration of the situation warranted the captain to issue orders to abandon ship. Two US Coast Guard helicopters were dispatched to the scene, rescuing 14 of the 16 crew members. No word yet on the other two crew members. I'm wondering why this ship was even out there. The fifteenth "unresponsive" crew member was rescued; the search continues for the captain. This ship was built in 1960 for the movie Mutiny on the Bounty. 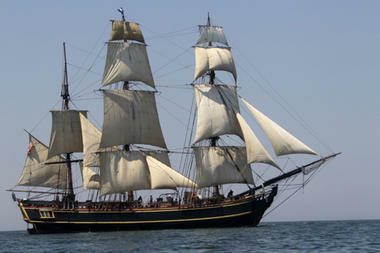 One dead, 14 saved, one missing, as tall ship HMS Bounty sinks off Hatteras. That is so sad. After reading about it, the captain believed that it was safer to be out a sea than at dock, but the systems failed and the ship floundered. These were very brave men in an uncommon situation.